Ask fellow campers about "OK RV Park" and nearby attractions. 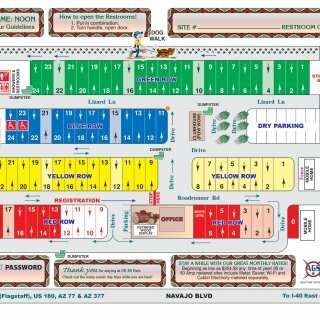 This basically a large parking lot. It was formerly a mobile home park and there are some nice trees. The pull throughs [I think all are pull throughs] are very long and the streets are very wide. Everything works well--utilities, wifi, phone, and the staff is helpful and friendly. It's an excellent park for exploring the petrified forest. We camped at OK RV Park in a Travel Trailer. We try to stay at family run parks and this park is owned and managed by a husband and wife. They purchased it a few years ago and you can see the upgrades, especially based upon some prior reviews. You can see that as the trees grow they will provide more and more shade. Water is great, easy to adjust to 40 lbs pressure. It is a desert campground and it is surrounded by desert so when high winds come up, expect some dust. We stayed for 4 nights. The park was an ease to enter and the spaces are staggered so even though you are close, you are not next to your neighbor. Internet and cable worked great (though with our TV/Cable system we had to scan the channels first, not campground's issue. I have never seen a park with such a good sewer set-up. There are sewer connections about every 10 feet along the driveway so you are assured that even with a 10' hose you will connect. The park is huge so there is very little big rig/small rig jockeying for driveways. They have a small store with essentials and they serve coffee and muffins every morning. We will stay here again when we come through in early fall. Grateful that there are parks such as these. Great place to stay when visiting Petrified Forest National Park and Winslow Arizona (Eagle Song). If you are an Eagles fan you have to visit Winslow. They have a corner dedicated to the song and it is just plain fun to see the joy and humor the town has set up for travelers. For Weather, use Weather.com, hourly. We found that weather for Holbrook was more accurate for the area; I used the zip code when searching. We camped at OK RV Park in a Travel Trailer. We used this park to visit many ares in all directions This worked well for us! Great personnel. Very helpful. Utilities have been updated recently and no issues. Hookups quickly completed. Cable worked well. Wi-Fi iffy. Satellite friendly. Verizon worked well. Had a lot of rain and tracked a lot of sand into unit. We camped at OK RV Park in a Motorhome. Small town but plenty of shopping and restaurants. Visited Painted Desert, Petrified Forest, Courthouse Museum several rock shops. We did an overnight at this park on our travels. We had a full hook up site. Power, water, and sewer were good. They stagger the sites so you're not right on top of your neighbor. Coffee and muffins in the office each morning. Gravel site, level and accessible. We camped at OK RV Park in a Motorhome. We stayed for 3 days, to go to Petrified Forest/Painted Desert. All sites are very long pull throughs, are compacted gravel with a picnic table. Electric, water worked well. Park has wifi password, we didn't use, we use a hotspot. Staff was extremely friendly and helpful, they even offer muffins and coffee in the morning, which were yummy! Due to rain, we didn't spend much time around the park, but overall it was clean and well taken care of. We camped at OK RV Park in a Fifth Wheel. Winslow is 25 miles away... has corner with statues and drawings, truck depicting The Eagles song Takin It Easy.... "Standing on the corner in Winslow, AZ"..... fun! Also, check out the Wigwam Hotel... they even have a bunch of old cars, trucks parked around... like the movie Cars.. on Route 66. Basically a big gravel lot with old utilities. The power poles have no breakers, just a hole in the panel where one should be (code?). I asked for a level site (this is the AZ plains) and I had to block up the driver's side. I would not stay here again even for overnight. We camped at OK RV Park in a Motorhome. Very friendly staff. Alternating pull throughs that are so long you could fit 2 trailers plus tow vehicles. Site was level with a tree at one end. Power voltage was on the very low side of green on the gauge. A good base camp for exploring the petrified forest. We camped at OK RV Park in a Fifth Wheel. We stayed here for one night on our way to Phoenix. Nice long gravel pull thru sites. Did not have to unhook the tow. Only complaint is having to walk the dog in the area behind the green row. There is zero shade along the fence and no grass. Would be nice to have a fenced in dog park centrally located. We camped at OK RV Park in a Motorhome. Not a 5 star park by any means. But it is a great spot to stop and see the Petrified Forest. Dirt and gravel sites, some shade trees. Friendly camp host. No dog run or grass. There is a dog run with grass about a mile away. For a 1 or 2 day stop this place is ok. We camped at OK RV Park in a Fifth Wheel. We stayed 2 nights. Should have stayed a few more. Friendly office personnel, they serve code and home made muffins every morning. Information on the local sites ttyl see. Not much shade. Very long pull thru sites. Gravel but very level. Clan facilities. We camped at OK RV Park in a Fifth Wheel. Petrified national park. Winslow AZ, meteor site off edit 233. This is a convenient park to visit the Painted Desert and Petrified Forest. 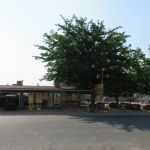 Easy short drive to downtown Holbrook for groceries, eating, or visiting shops. This campground has many long term or permanent residents with many of the sites looking extremely old and not well kept. Gravel and dirt which is to be expected in the SW. Many people have dogs, but no one seemed to pick up after their dogs except me and our traveling companions who also have dogs. We were warned to not walk by the yellow row as there is a permanent resident to hates dogs and will come out and yell at you if you walk that direction. Hook ups were sufficient and sites were wide enough and long enough for our 35' fifth wheel and truck. There is a decent Mexican restaurant across the street from the entrance. We camped at OK RV Park in a Fifth Wheel. Stayed here over night while we visited the Petrified Forest. Sites were nice. Facilities were very very clean. Camp Staff were great and very nice. Hookups were great also. Convenient to the Interstate and the Mexican restaurant across the street was awesome. We camped at OK RV Park in a Travel Trailer. 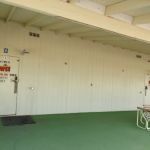 Excellent facilities, quiet, safe, clean, friendly staff, very large pull throughs with multiple sewer outlets, easy access off the freeway, easy fueling for trucks, RV's, large vehicles at the Maverick a minute away. Also Pizza Hut delivers there pretty quickly & food was still hot! We camped at OK RV Park in a Fifth Wheel. Do not miss going to the Petrified Forest Natioanl Park. Gorgeous areas from top to bottom. Petrified Forest. We walked the dog down the dirt road to the LDS church. There's some grass there. Very close to Petrified Forest/Painted Desert Nat Park to the East and to Meteor Crater to the west. There are a lot of things to do in the area, such as Meter Crater, Hubbell Trading Post, Petrified Forest NP, Rock Art Ranch, Hidden Cove Park, which they advertise on their brochure. Holbrook, AZ is a small town. Navajo is the main north/south drive. McDonalds, Taco Bell, Pizza Hut, others. No national restaurant chains. Safeway grocery on south side of interstate on W. Hopi Drive. Some local restaurants. No Wal-Mart. Diesel at Maverik $2.659. Wells Fargo bank. No RV stores. Didn't see a hardware store. O'Reillys. Petrified Forest National Park is 25 miles east. 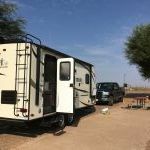 The campground is about 25 minutes from either the North or South entrance of the Petrified Forest National Park. There's a Safeway a few miles away from the campground. We stayed here twice. Once to visit the Petrified Forest and once as an over night stop over. You won't run out of shops selling petrified wood. A day is plenty to visit the national park. Pizza Hut delivers as they are right across from the CG. This is close to the Petrified Forest National Park and Painted Desert. Beautiful! It is also near Winslow, Arizona where you can "stand on the street corner and see the red flatbed truck" (made famous by the "Take it Easy" song by the Eagles) and tour/eat at beautiful restored La Posada Hotel. And don't miss the Wigwam Hotel in Holbrook. These are tee-pee-shaped hotel rooms with a great old car sitting outside each room...the inspiration for the similar scene in the movie Cars? Avoid the Meteor site. It's $18.-- per adult. Not worth it. There is a Safeway store in downtown Holbrook. Painted desert, petrified forest, lots of rock shops. Make sure to check out the wigwam motel which is on the old route 66 and a classic. Fuel, shops and attractions a close to park. Petrified Forest/Painted Desert NP, awesome! A few places to eat within walking distance if the weather is good. No "fine dining" anywhere that we found but all places were OK. Visit Jim Gray's petrified wood "store". Info in campground brochure. Amazing. Easy drive to the Petrified Forest and Painted Desert monuments. Plan on an entire day to see them both. Two days would be better if you can. Stayed here while seeing painted desert, petrified forest. Would stay again. Call ahead, tons of overniters. Petrified National Park 20 miles away. 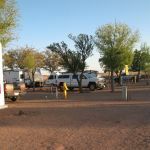 Stay away unless you are going to Painted Desert and Petrified Forest; only go to this RV park if you are in need of an overnight parking spot with hookups. You can visit Petrofied Forest park, Meteor Crater and Harvey House in Winslow. All great places to visit. Very convenient to the Petrified Forest ... the only reason to stay at this campground. The surprising thing about this little town is the Mesa Italiano restaurant. A favorite of locals, it's located on business I-40 at the east end of town. They serve really good Italian food at reasonable prices. Also, there is a gas station just outside of the park that has easy access even when pulling a tow car. Easy drive to Painted Desert and Petrified Forest. Petrified Forest/Painted Desert NP and Winslow, AZ (Standin' on the corner park) are worth a trip. Romo's is a good place for SW food. The Petrified Forest and Painted Desert are about 20 miles away. If you have time, check out Jim Gray's Petrified Wood Company located on highway 180 on the way to the south entrance of the park. There are many amazing pieces of petrified wood, furnishings, jewelry, pottery, fossils, and minerals for sale. OK Campground gives out coupons for a 1/2 pound (about 1" X 2" piece) of petrified wood free. This is a good place to stay when visiting the Petrified Forest and Painted Desert National Parks. According to Trip Advisor, Mesa Restaurante Italiana is the #1 place (of 30) to eat in Holbrook, but don't bother! Food was poor quality; service was slow; wine list terrible. Find someplace else to eat. Great location to stay while visiting the Painted Desert and Petrified Forest National Parks. Downtown Holbrook has the historic Route 66 feel. Easy access to the Maverick Fuel Station near I-40 exit and entrance. Well laid out for large rigs with tow vehicle connected. Immediate area has many restaurants both fast food and dine-in available. You can walk to fast foods + Mexican restaurant & Pizza Hut delivers. Explore the petrified forest/painted desert...Buy some at Grays...just south of town which has a HUGE outdoor & indoor collection of VERY large to small pieces if you don't have time for the park. There's also some right at the park office. We also loved looking at the Wigwam motel downtown. Holbrook does have the iconic Wigwam Motel, "Have you slept in a wigwam lately?" , from the halcyon days of Rte 66. It is worth a picture. Drive West to Winslow, it is faring somewhat better. You can go downtown and "Stand on the corner in Winslow,Arizona". Also, La Posada Hotel is the last of the great Fred Harvey Santa Fe Railroad restaurant/hotels, is completely restored and operating. Common areas can be toured, great restaurant and gift shop. Must see! Petrified Forest National Park nearby. It's a nice, interesting place to spend the day in cooler weather. There is a Safeway in town but up a side street. Good spot to go to Petrified Forest, Painted Desert and Canyon de Cheilly, which is brilliant and free!! Don't bother with Window Rock, very disappointing. Near the Petrified Forest National Park. Holbrook has several okay mom & pop restaurants. Watch the introductory movie at Petrified Forest to understand what you'll be seeing. Ditto for Meteor Crater (privately owned, $18 admission, $16 for seniors, but it is the best-preserved impact crater in the world). Best diesel prices in the middle of the small town. Plenty of shopping for petrified wood in the area. It is also a good place to park while visiting Petrified Forest and the Painted Desert National Parks. 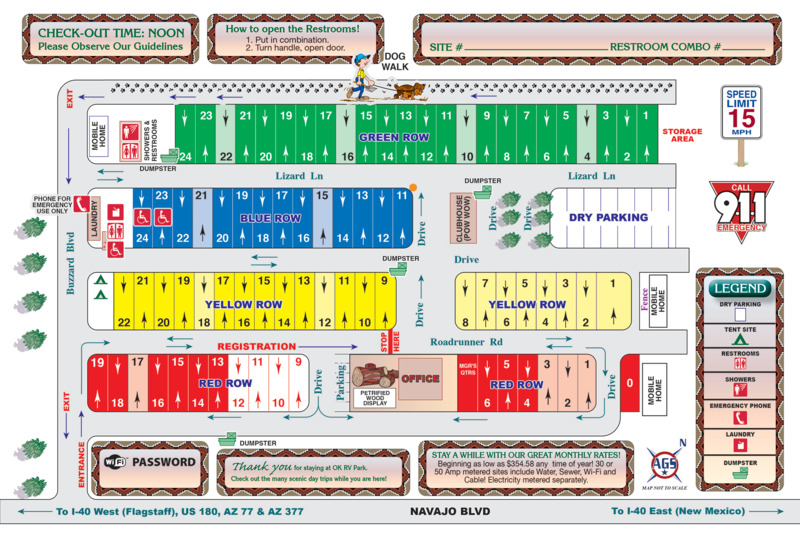 Are you affiliated with OK RV Park ?